If the renal hilum cannot be located, Gerota's fascia should be incised longitudinally, along the psoas muscle. The kidney should then be retracted anteriorly, placing the hilum on stretch. The laparoscope is then slowly advanced across the anterior surface of the psoas muscle from lateral to medial in a cephalad direction. 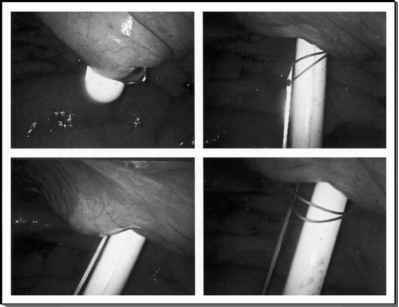 With the laparoscope held steady, a search is made for pulsations along the medial border of the psoas. Gentle dissection directly toward the pulsations should reveal the underlying vessel. Alternatively, the ureter can be followed cephalad to the hilum. Finally, the surface of the kidney can be identified and traced medially to its hilum.